We thus face the danger that the euro, the world’s No. 2 reserve currency, could implode. Such an event wouldn’t be just another depreciation or collapse of a currency peg; instead, it would mean that one of the world’s major economic units doesn’t work as currently constituted. There are a lot of claims -- some implicit -- in here. I'll take them in turn. 1. 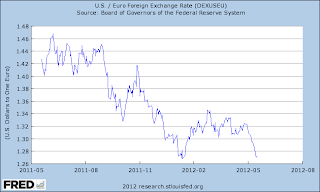 Does an exit of several peripheral countries from the eurozone constitue an implosion of a reserve currency? I don't think so. The status of the euro as a reserve currency does not depend on Greece's membership, it depends on Germany's management of it. If the alternatives are to jettison Greece -- or even several of the GIPSIs -- or to devalue the currency to keep them in, the euro's status as a reserve currency might actually be improved by a smaller membership of weak countries. 2. 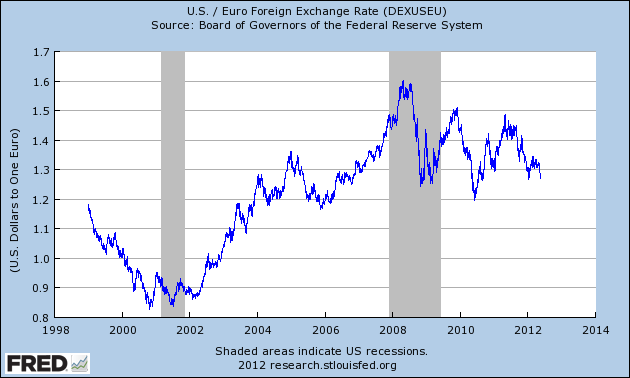 How important is the euro as a reserve currency? Roughly as important as the German mark was pre-euro, perhaps in combination with the the franc. 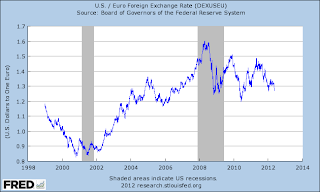 The euro has not advanced much above the mark+franc status as a global reserve currency, if any at all, since its introduction in 1999. So the global economy as a whole does not appear to be very dependent on the euro; it is dependent on the US and, to a lesser extent, Germany, Britain, and Japan. 3. Would a euro-exit be more severe than a collapse of a currency peg? It conceivably could, but again: what matters most is Germany, and markets' belief in Germany's credibility to maintain a valuable currency. Germany's economy is not on the verge of collapse, nor does it depend on Greece, and German policymakers have repeatedly chosen to maintain policy credibility over possibly saving peripheral members. How much do markets care about Greece? I'll return to that below. 4. Would a euro-exit signal that one of the world's major economic units doesn't work? No. Greece is not one of the world's major economic units. A euro-exit would signal that one of the world's major political units doesn't work, but I'm not sure that this is new information nor am I sure that markets care all that much. The the extent that markets prefer stability over instability any resolution may be preferable to continued uncertainty. Let's look at some data. Has the euro has significantly weakened as the crisis has grown more severe? If Greece leaves will the value of the euro hold? Considering that Greece is by far its weakest link I would think so. Indeed, the fewer non-German members in the euro the more credibility it has! Germany does not need to devalue. Anyway, just how important is the euro? At the end of last year global dollar holdings were nearly 250% higher than euro holdings. Or consider the exchange market. 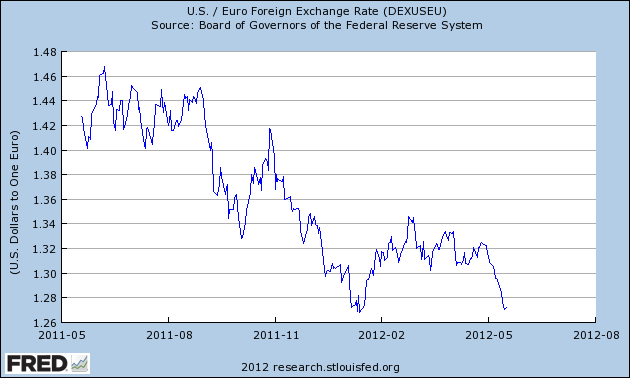 The introduction of the euro did nothing to reduce the world's reliance on the dollar, as I discuss (and graph) here. The euro is used in roughly the same percentage of the world's Forex as was the mark + franc. The global economy survived the end of those currencies. There is only one truly important global currency -- the dollar. I said a bit about that in my post yesterday, and I'll say more about it in another post (this is plenty long already), but if the hegemon is most important than we should really only be concerned about the US (the global hegemon) and Germany (the regional hegemon), not Europe's southern periphery. And the role of the hegemon is to stabilize the system, not necessarily to guarantee good outcomes for every constituent within it. Think about it this way: if Germany left the euro and re-issued the mark, do you think it would be stronger or weaker than the Germany-less euro? Do you think the new mark would be used more as a reserve currency than the euro or less? So why should we think that a Greek exit would be much worse than "another depreciation or collapse of a currency peg"? I hope you find these lists beneficial.